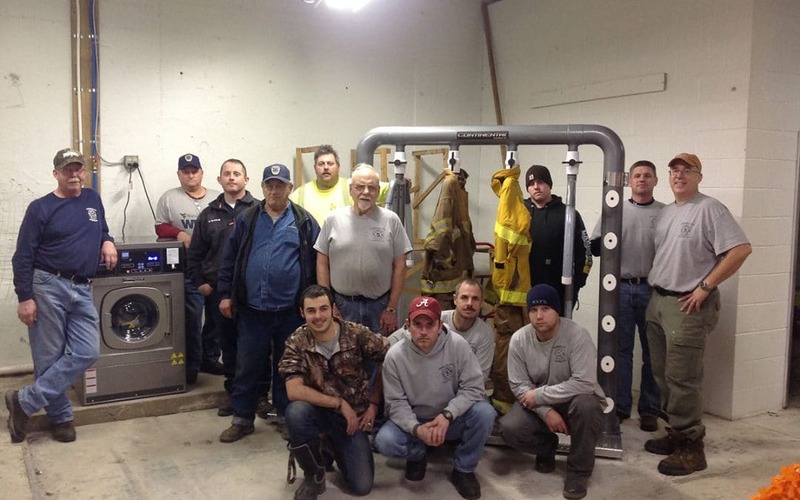 Which Gear Dryer Should I Buy For My Fire Department? At the forefront of defending our homes, lives, and livelihood against supernatural destruction is firefighters. These modern heroes dedicate their full-time and part-time lives in order to protect us. But the danger does not end after the call. It continues even as they get back to their department. The danger lingers in the very fabric that is created and regulated to protect them; bunker and turnout gear. At Advantage Equipment, Inc., we specialize in helping assistant fire chiefs and fire chiefs find their washer-extractors & gear dryers. 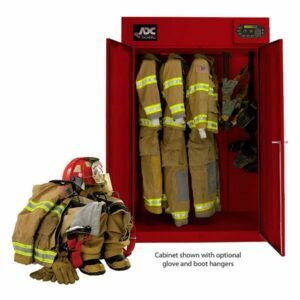 In this article, we will break down each of the turnout gear dryers offered, how many sets they hold, unique features, and more. The ADC Gear Cabinet Dryer is unlike any of the other options listed on this article. The ADC Cabinet offers your department the total enclosure feature. 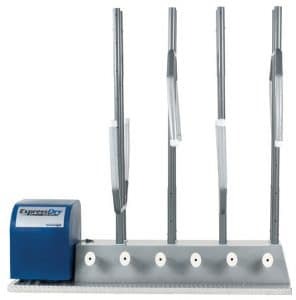 This decreases the overall time needed to dry various types of gear. This includes turnout and bunker gear, helmets, balaclavas, boots, and more. In addition, this cabinet also offers a microprocessor control that enables you to customize what temperature you want to dry articles at. These presets can dry for up to 4 hours, and it all begins with a touch of a button. How it works: the cabinet is plugged into either a 1 or 3 phase electric outlet. This powers two separate blowers that ultimately can dry up to 5 sets of gear. The air pushed out by the blowers ensures that warm air penetrates every aspect of the cabinet – regardless of how tight an area may be. In addition, shelves are available for boots, gloves, and hoses. Colors available include red and white. Leading the charge for Ram’dAir is their turnout gear dryer which holds either 4 or 6 sets of gear. Although the dryer is not a cabinet feature like the ADC listed above, the stick men still present a thorough drying experience. They reach even the hardest areas that are prone to mildew and mold. In the chance that all stick men are not being used, air can be shut off to the specific unit. At the end of the base sits an easily removable motor that can be used to dry department floors or hooked to pump trucks. This not only makes it easier to do routine maintenance, but it also protects your investment by preventing freeze-ups in the winter months. In some of the smaller departments like volunteer stations, space is limited. With Ram’dAir (& Continental ExpressDry) Gear Dryers, this problem is solved with swivel casters placed underneath the unit. There are 12 or 18 different ports available for drying gloves, balaclavas, helmets, etc. (depending on the model). Finishing off the overall finish of the the unit is powder coated and 12 gauge steel – complimenting the overall look and feel of your department. Also available: Special Ops Unit for Hazmat suits like dry hazmat, immersion, and ice-rescue gear (second picture below). Last by not least is Continental Girbau ExpressDry Gear Dryers. You can buy dryers in three different models: Special Ops C4-IHT, ExpressDry Gear Dryers C4-MU, and C6-MU. Powering this is a 110-volt fan that pushes large volumes of air throughout the garment from the inside out. Dryers utilize ambient air which significantly reduces utilities and ultimately saves your department money. You also do not risk voiding your warranty by utilizing Continental Girbau’s gear dryer. 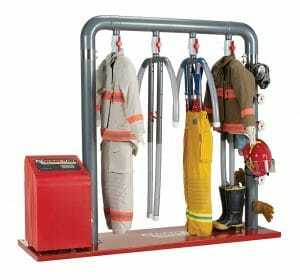 The ExpressDry Gear Dryer also handles helmets, boots, face masks & self-contained breathing apparatuses (SCBAs). Included in all Continental Girbau models are LED timers with automatic shut off, casters for easy movement, steel construction, removable 800 cfm blower and noise reduction package, and up to 12 accessory drying ports. The removable blower can be used to dry garage floors for quick winter drying. These have an operational life span of 87,000 hours, are NFPA compliant, and carry a 3-year ContinentalCare warranty. In terms of Special Ops, the specific dryer can fully dry four pairs of soaked boots in just 60 minutes. 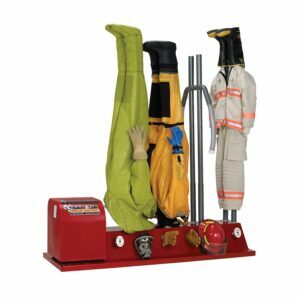 Included are inverted stick men which are ideal for drying swift water and ice rescues, as well as 12 accessory drying ports. From the beginning, we have been working with fire departments. Our goal is to protect those who protect us. We hope that you learned a little bit more about your department’s needs in terms of gear drying. If you have any questions, feel free to email Nick at parts@advantageequipment.net. If you are interested in seeing what gear extractors we offer, you can find that by clicking here.